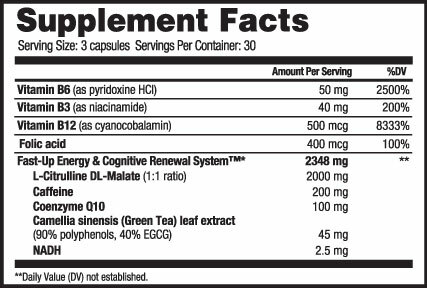 Fast Up By Beverly International, 90 Caps at SameDaySupplements.com® for lowest price. What Is Beverly International Fast Up? Why Do People Like Fast Up? Clients tell us that Fast-Up works faster and feels better than coffee and other energy boosters. Premium-quality formula: Fast Up contains premium ingredients like NADH, co-enzyme Q10, citrulline malate, and B vitamins to support cellular energy production, alleviate fatigue, enhance mood, and reduce free radical levels. This isn’t your dollar-store energy shot! Who Is Fast Up Ideal For? Fast Up is ideal for the majority of people who want to boost their en ergy, mood, and cognitive performance before working out, work, or school. Many clients use it as a pre-workout.Secrets to Success Adjust your starting dose according to your caffeine tolerance. For instance, if you typically drink 1 cup of tea daily, you may want to start with 1-2 capsules.Whereas, someone who drinks 2 cups of coffee every morning, should start with a full serving (3 capsules). What's In Beverly International Fast Up? How Do I Take Beverly International Fast Up? Flexible dosing: One serving (3 capsules) provides 200 mg of caffeine, equivalent to 1.5-2 cups of premium brewed coffee. Simply take fewer capsules if you want a smaller dose of caffeine. We have a large selection of in-stock Beverly International products including Weight Loss & Energy items and others for the lowest prices at SameDaySupplements.com® It's always easy to shop for Fast Up By Beverly International, 90 Caps at SameDaySupplements.com because you can browse by reviews, brand, prices or search for specific ingredients using our search tool. In-stock orders placed before 3pm EST ship out the same day to USA, Brazil, United Kingdom, Canada, Germany, Australia, Japan, India, France and worldwide at the cheapest prices online.